Reconciling economic prosperity with environmental protection requires wise regional development. Over the last years, the bioeconomy has been held aloft as the eco-friendly solution for a post-oil society. The buzz around bioeconomy envisages a biotransformation of the main economic sectors, from construction to transport and fashion, by maximizing the potential of emerging digital bio and nanotechnologies. In the future, biomass is transformed into advanced biomaterials, products, and services, reducing non-renewable resources to a minimum. But bioeconomy shouldn’t be taken as a byword for environmental sustainability and one size certainly does not fit all. Producing, collecting and transforming biomass, as well as transporting finished products needs careful consideration as part of a multi-faceted approach. Circular, low carbon and resource efficient developments are needed, that take regional realities into account and seek solutions across sectors. In southern Europe, current country bioeconomy strategies focus on developing bio-based sectors, especially agriculture, with no clear connection to broader environmental or industrial policies and largely taking sustainability for granted. In these strategies, forests are seen as relevant sources of biomass as well as providing important ecosystem services. Yet they provide little guidance on how to overcome existing barriers and to ensure that increased reliance on forest-based goods and services delivers the expected positive economic, social and environmental impacts. 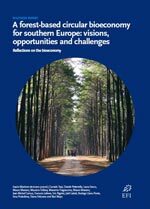 A new synthesis report coordinated by the European Forest Institute “A forest-based circular bioeconomy for southern Europe: visions, opportunities, and challenges” considers the elements required to radically transform production and consumption patterns in this region, with its huge diversity of landscapes and land use. “The concept of circular bioeconomy presented in this report can be a decisive development to make (...) transitions possible,” comments Bittor Oroz Izagirre, Deputy Minister for Agriculture, Fisheries and Food of the Basque Government. ”It holds the promise to reconcile economic development with environmental protection in a post-oil era”. The report explores the potential for a circular bioeconomy tailored to southern specificities, where increased reliance on renewable, biological resources is combined with increased resource efficiency and circular material loops. A circular bioeconomy focuses on renewable, reusable, recyclable and biodegradable products as part of a holistic, locally-focused approach. Nature-based tourism, short value chains and putting a value on the goods and services that forests provide to people have enormous potential to contribute to economic development in many regions. They are frequent priorities in regional smart specialization strategies but should receive greater attention in national bioeconomy strategies. The synthesis report was financed by the Basque Government’s Department of Economic Development and Competitiveness, synthesizing existing scientific knowledge with ideas discussed and refined in a set of thematic workshops held across southern Europe over the past two years. Martinez de Arano, I., Muys, B., Corrado, T., Pettenella, D., Feliciano, D., Rigolot, E., Lefevre, F., Prokofieva, I., Labidi, J., Carnus, J.M., Secco, L., Fragiacomo, M., Follesa, M., Masiero, M. and Llano-Ponte, R., 2018. “A forest-based circular bioeconomy for southern Europe: visions, opportunities and challenges” Reflections on the bioeconomy. European Forest Institute, 124pp. ISBN 978-952-5980-59-2.